Imagine being caught in a thunderstorm as wide as the Earth with discharges of lightning 10,000 times more powerful than normal, flashing 10 times per second at its peak. Now imagine that this storm is still unfolding, eight months later. One of the most violent weather events in the Solar System began to erupt on Saturn last December and is still enthralling astronomers, the British journal Nature reported on Wednesday. Two studies draw on observations by professional and amateur astronomers using a broad range of gear, from relatively small ground-based telescopes to NASA's magnificent scoutcraft, Cassini. 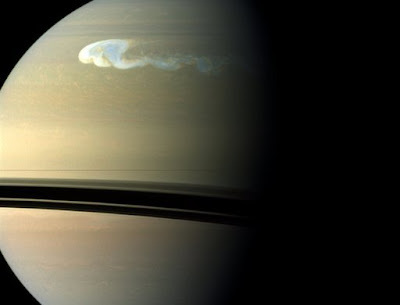 Saturn, like Jupiter, is no stranger to convective storms. It too is a "gas giant," or planet comprising layers of thick, roiling gases rather than a rock, like Earth, Mars, Venus and Mercury. The difference, though, is that jovian mega-storms tend to erupt unexpectedly, but the lord of the rings gives birth to a monster almost periodically. It occurs on average once every Saturnian year -- nearly 29.5 Earth years -- and appears to be linked to the summer solstice, when the planet's orbit brings it a bit closer to the Sun and its atmosphere warms a little. The event is known as the "Great White Spot" (a counterpart to the swirling "Great Red Spot" on Jupiter) because of the mass of brilliant white storm clouds that erupt in the upper atmosphere. The show is so big that it can be visible by telescopes from distant Earth. Five have been observed in the last 130 years. The last occurred in 1990. But the current Great White Spot is proving to be a dazzling spectacle, revealed by an unprecedented array of observational power at hand. Events began at 2105 GMT on December 5, when ground-based telescopes detected a "barely visible white point" on a normally unblemished and hazy part of Saturn's northern hemisphere, at around latitude 35 degrees north. At the same time, Cassini turned its "ears" towards the target, listening in to radio emissions from the storm via an onboard plasma-wave instrument. These signals are the telltales of lightning. Lightning cannot be seen visually on Saturn at night because of interference from sunlight scattered from the planet's ring system, which comprises billions of shiny particles. Within a few weeks, the point had ballooned into a storm system that was some 10,000 kilometers (6,000 miles) across, roughly comparable with the diameter of the Earth, and after two months the clouds had almost encircled the entire planet. Analysis of the data suggests that the "spot" is in fact a cluster of super-storms, produced by upwelling of heat, moisture and ammonia from water clouds from lower down in the Saturnian atmosphere, where the pressure is high. As this mix rises into a cooler atmospheric layer called the tropopause, bright, white clouds of ammonia start to spread horizontally into a tail, sculpted by eastward jets of wind. Astronomers are especially intrigued by the current Great White Spot. The observational history of this phenomenon is sketchy. But evidence suggests the present spot is exceptionally intense and rather premature, for it was still spring on Saturn when the storm brewed.